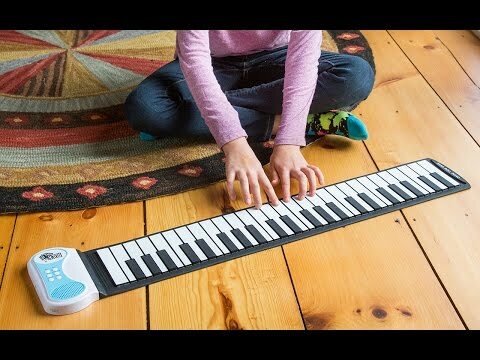 Unroll and play this portable piano anywhere. It features multiple keyboard tones and demo songs—you even have the option of record and playback for your mini masterpieces. It runs on batteries or USB so you can play when you travel, camp, or move around the house. Practice on the built-in speaker or hook it up to the sound system for a performance, then roll it up when you’re done. Dimensions: Open: 31" x 6" x 1"; Rolled: 6.25" x 8.5" x 3.25"
The product was a gift from Santa and it was working for one day and then stopped. The drum set I bought that is a similar product NEVER worked. I have to send it back and my child is wondering why Santa would give him a broken toy. 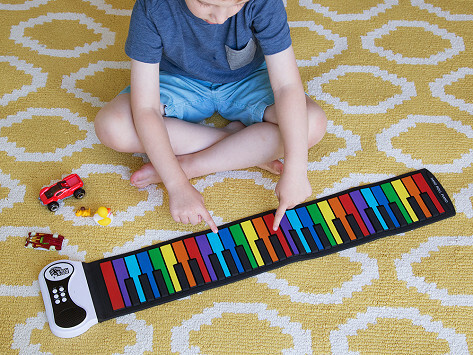 These piano and drum sets are made from a soft, flexible silicone that you can fold and pack to take anywhere. Maker Zvika Givli wanted to make sure his daughter could practice piano beyond the confines of their living room. He invented a small one she could unroll to play while camping and traveling. Both sets have a headphone jack so you can play without disturbing anyone else. The piano also has a built-in speaker—loud enough for your own entertainment. The drums don’t have their own speakers, but with both instruments you can hook them up to an external speaker and play for an audience. To make them extra portable, each instrument runs on batteries or via USB. To get your creative juices flowing, each has ready-made tracks. Once you play your own tunes, there’s an option to record and play back your masterpiece.